The former Arsenal star has been heavily linked with the job after Leonardo Jardim was sacked from the position. THIERRY HENRY HAS been confirmed as the new Monaco manager, the club has announced. The former Arsenal star has been heavily linked with the job after Leonardo Jardim was sacked from the position with the club sitting third from bottom of France’s Ligue 1 table. The 41-year-old, who had been working as an assistant coach for the Belgian national team, has signed a contract which will see him take charge until June 2021. Henry knows Monaco well having graduated from their youth system and making his professional debut for the Principality club in 1994. He also scored seven goals in the 1997-8 Champions League season. He was then sold to the Turin club and went on to a successful spell with Arsenal in England and World Cup and Euro 2000 winners medals with France. Henry will be joined by Joao Carlos Valado Tralhao, and Patrick Kwame Ampadu, a coach at the Arsenal Academy. “In the first place, I thank AS Monaco for giving me the opportunity to coach the team of this club so special to me. Email “Confirmed! Henry announced as new Monaco manager”. Feedback on “Confirmed! 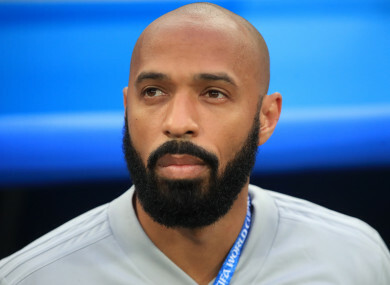 Henry announced as new Monaco manager”.